We have lived here just over eleven years and this is the first time we have seen a squirrel in the yard, or the neighborhood, for that matter. I quickly put some of Bunbun’s leftover food in the bird feeders for it, but as soon as it thought it was safe, it scampered away and over the fence next door. Darn! I wanted to watch it gobble up the goodies I put out for it. 21 more stars to go! I timed myself on the last two and it took me 35 minutes to get them done. I should have between 5 & 6 more hours of star sewing left to have all the blocks done. Then I can decide on the final layout and start getting those rows together. That is an awesome picture!!!!!!! 😀 Those stars are looking good!!! Please take our squirrels!! They take all of our bird food and eat holes into the attic. We love watching the squirrels on our roof garden — they are pure entertainment, although I do realise some people really do not like them! Your star quilt looks like it’s going to be fabulous! I love the fabrics you’re using. What a cutie! We don’t have squirrels either — not the right kind of trees I guess. Your stars are coming along nicely. 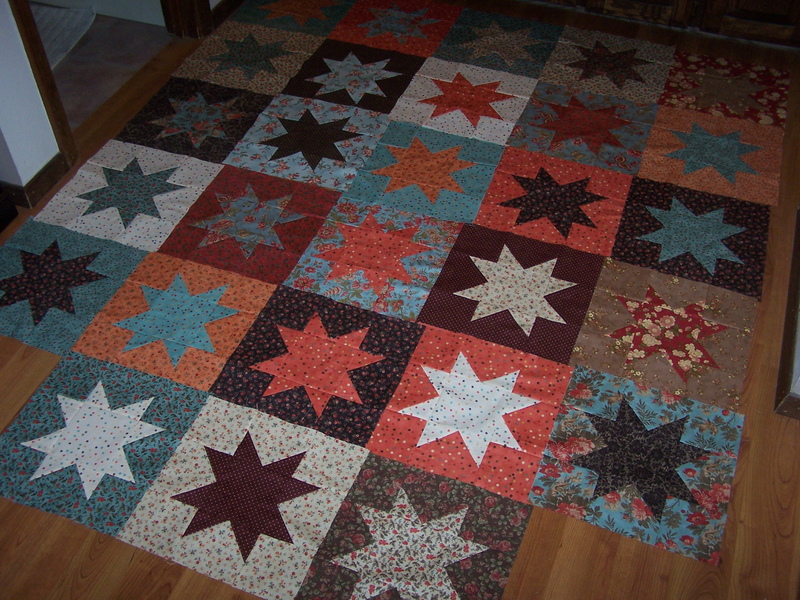 I have seven star blocks done in that same fabric that have been ‘aging’ for a while — maybe I’ll get them back out. Love the picture and those stars! 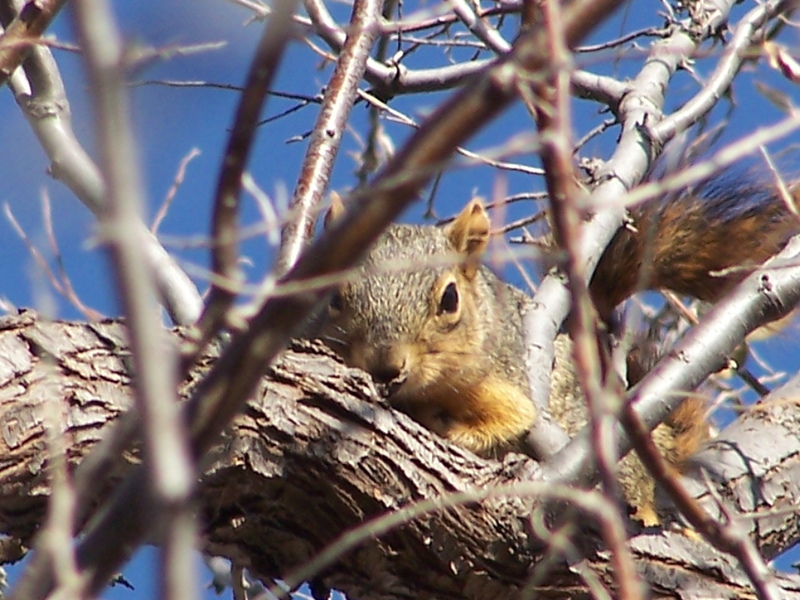 I love squirrels – most likely because it was my nickname when I was a kid. 😉 What a great picture. You are certainly making some awesome headway on that quilt. It looks great. I love it, Randi! The colors are rich and warm. I look forward to seeing the finished quilt! I find it odd when you get to a point where something that has been comfortingly repetitious suddenly becomes a huge bore even a bolder and you have to push and push to move it along. I would be pushing……..with stars at that point. I must make more and not be phobic about them. The stars are looking great, and what a great picture of the squirrel. I really love these stars – I’m going to have to move the Sawtooth Star quilt on my list up closer to the top – I’d love to get it pieced this year.